Linda, get a grip on yourself! You’re becoming an insufferable bore. The woman at the checkout at Weaver Street doesn’t want to hear about Harumi and Kotori’s love of chickweed. She is not much interested in imagining just how soft Kotori’s feathers are or in listening to you gush about the cute way Harumi gears up before flapping to your shoulder. On second thought, what is the matter with this person? She must have a heart of stone. Everyone wants to hear about these sweet, precious, little birds. Right?! So show the twenty three photos you’ve taken in the last 15 minutes, and keep crowing about these tiny hens. The world is listening! I was up before the sun as usual, and as I drank my tea and ate my oatmeal, I pondered what the day would bring. I know it will bring heartache along with the satisfaction of being sure that my vegan approach to everything is the right way. There is a clamoring in my head over the plight of animals which has become as familiar to me as my own hands. I recounted the conversation with a good friend who is miserable over the negligent behavior of neighbors with their backyard hens, and I read the plea from a rooster rescuer as I opened my computer. I am fortunate to know so many good, hardworking people who are trying to make a difference for individual animals and for the billions caught in systems of exploitation, but I know so many others who are content or indifferent enough to live with and support the cruelty around us. What would it take to live as so many in my midst live? This is no academic question as we are living with two young chickens in our sunroom. What would it have taken to lift Kotori up with a firm grip to bring her sensitive, flawless beak up to a hot cutting blade? What would it have taken to grasp this lovely, little dancer to shove her in a cage with others so that she could never unfold her wings again? What would it have taken to see to it that Harumi and Kotori never preened again or rushed within their ample space to see me? What would it take to allow my own selfish desires to take precedence over their need for fresh food, clean water, and a clean and comfortable space? What would it take to turn a deaf ear to their frantic vocalizing as they endured the “standard practices” of an industry that celebrates and gains from their lifeless bodies hanging upside down? Whatever it would take, I don’t have it, and for that I am deeply, deeply grateful. Kotori (top) and Harumi (bottom). I am like any other new parent in thinking that Harumi and Kotori are the most beautiful beings in the world! I wonder just how many photos I can post before people grow tired and turn away because, unlike the photos I took of our human son and our family of cats, there is more at stake than a mother’s pride as I snap away on my camera. I have a window of opportunity with these enchanting little birds that wasn’t needed with my son or our cats. People don’t eat human little boys, and many agree that cats should be part of the family. This is not the case with chickens. I want to convey to people just how interesting and unique Kotori and Harumi are and how very worthy they are of being alive and well. I want to convince people that they are not and should never be egg producers or Sunday dinner, nor should any of their species. I want everyone to know that they both start to peep madly when I walk in the room. Everyone should know that their flying skills have improved so much in a day that they are resting on my shoulders instead of my lap now. I want them to melt as I do when Harumi tilts her little head and trills to my trill. I want people to take in the gentle way Kotori pushes her head into my hand before she falls asleep. I’m not in a race to spare Harumi and Kotori’s lives. They have sanctuary with Triangle Chance for All for the rest of their lives, but I want others to think of these sweet young hens before they place the body of another in a frying pan or steal another’s eggs. The lives of Harumi and Kotori matter so much to me, and by extension, so do the lives of every other chicken and all other animals. Their lives belong to them, their lives matter, and their suffering and deaths are always a tragedy. And, now I have young ones to hold. There are few things more rewarding to me than gaining the trust of a non-human in my care. I’ve learned through long experience that what is needed is patience and a genuine desire to see others content and at peace. Kotori and Harumi are so comfortable with my presence now, and they both climb on my lap and settle down for long preening or napping sessions when I come in their room. It is just so enchanting to me as the preening slows, the feathers fluff, and their little eyes begin to close. Each girl likes different things. Kotori enjoys being picked up and placed on my lap and once there, she wants long, full-body strokes. Harumi would much rather get where she is going by herself, and I respect this. She will stand by my side, pull herself to her full height, and leap up to land on my lap with peeps and fluffs which never fail to wake her companion. She enjoys having her neck and the very top of her head stroked until she, too, falls asleep. I’m so glad to be providing Harumi and Kotori with what they need, but providing them with what they want is a better feeling still. I’m so honored to be able to create peace in their world. I just wish I could do the same for all of their brothers and sisters. Triangle Chance for All T-Shirts! Triangle Chance for All is in the process of printing up T-shirts!!! We’d like to get an idea of how many people would be interested in purchasing one before we place the order. They feature the TCA logo on the front and one of our favorite quotes from the Karaniya Metta Sutta. They will come in men’s and women’s styles, are made from organic cotton in size S-XL, and cost only $25. If you’re interested, please drop us a line at trianglechanceforall@gmail.com! I woke up in the middle of the night worried that it might be too cold in the house for Harumi and Kotori. Though I had made a nest of soft blankets for them, I still felt concerned enough to get up to turn up the heat. When I got back to bed, I experienced what I call “brain spin” as my mind raced from thought to thought. I thought about how very sad it is that there are so many farmed animals without mothers, and though I am doing my best, I am a poor excuse for a mother hen. Harumi and Kotori are doing just fine, but arriving in a cardboard box to someone’s door is no way to start a life. It is hard to even imagine the life their mothers have been forced to lead all for the hubris of humans. I started my yogic breathing to slow my mind down, and drifted off to sleep again. I know full well that I will wake another night with horrid thoughts of what so many do to other beings they consider lesser than themselves. Harumi and Kotori, the rescued chicks of Triangle Chance for All, are cozily settled in our bathroom. I’ve been sitting in there with them for the past hour reading about chickens and their care. The girls busily ate, drank, and swallowed some grit while I read. I put my book down when Harumi made a lovely, little trill. I did my very best to mimic what I had heard. She responded to my trill with one of her own. I trilled, and she trilled back while tilting her little head and looking up at me. We did this back and forth several more times! I’m loving this experience, and I believe they are, too! Lola the pig has proven herself to be quite photogenic and has gathered quite a fan club since being rescued by Triangle Chance for All on March 31st. As sweet as the maple syrup she smells of, Lola has been so happy and excited to be around caring people and other animals. Thanks to the generosity of her (and our) supporters, we were able to raise $500 to pay for her vet expenses, including a spay procedure, rabies and other vaccines, and a microchip. And today, Lola went to the vet! We decided not to get her spayed yet because she is overweight for her age (living in a tiny pen for four months, she surely got very little exercise), though we were able to get her vaccines and microchip taken care of. She is a healthy, happy lady with a clean bill of health–though running around the yard some more could help! 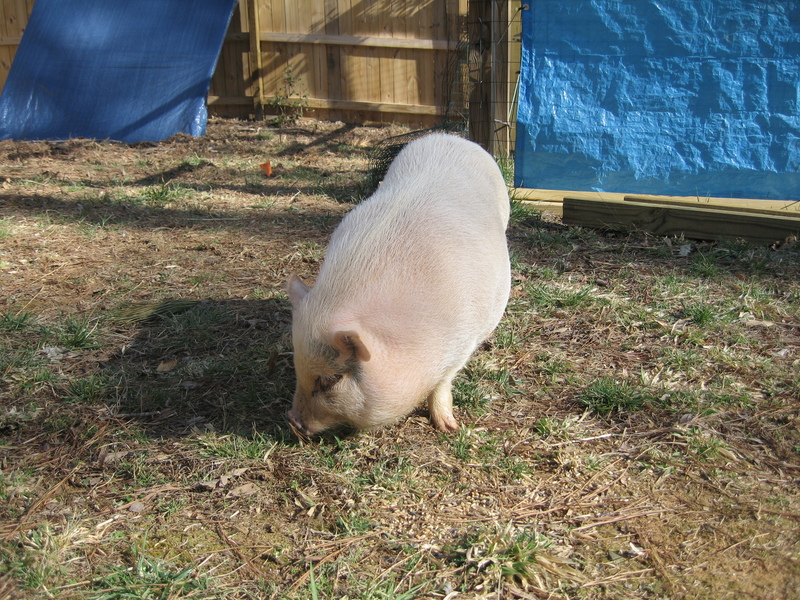 Instead, Lola will get spayed at her new forever home: PIGS Animal Sanctuary in Shepherdstown, West Virginia! 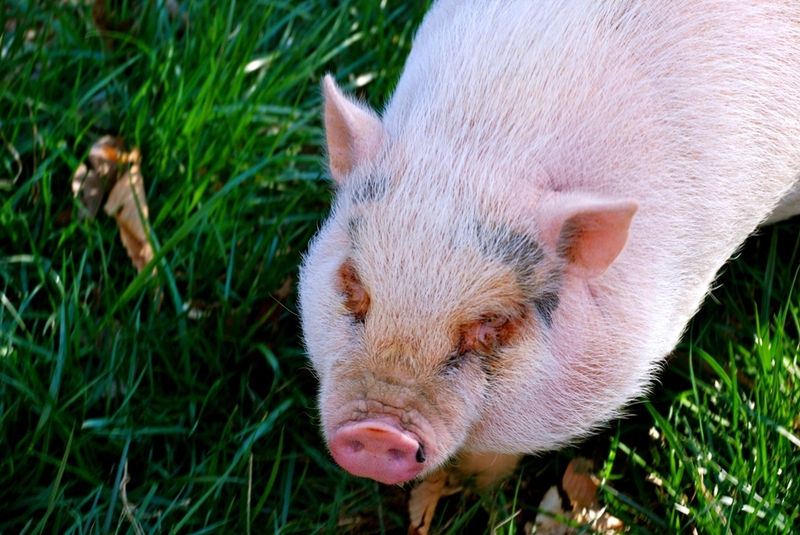 Specializing in their namesake animal, PIGS has been providing sanctuary to animals for 25 years! We met one of their board members, a vegan of many decades, at the auction for Bubba the ram back in January. PIGS has been kind enough to offer Lola a permanent home where she will be able to roam around with other pigs on eight acres. They have also offered to spay Lola after she arrives on April 14th, so that she can recover in her own time and receive their expert care. Triangle Chance for All will be donating the remainder of the crowdfunding funds to PIGS to help cover Lola’s spay expenses. We here at Triangle Chance for All have been amazed yet again by the power of one individual to change the lives of so many others around her. She has helped us to learn about the joyful personalities of pigs. We are grateful to Lola for all she has given us, we feel lucky to spend a little more time with her, and we wish her well in her new home with so many new friends to be made. While driving with Lola to the vet’s today, I was passed by a large transport truck, carrying two levels of piglets. They stuck their tiny legs through the holes in the sides of the metal box hurtling down the highway, and they peered out at the landscape speeding by. With Lola asleep behind me, I could feel nothing but pain at the realization that these hundreds of individuals faced a horrific fate … merely because so many humans considered them food, not friends. Lola the Pig, Triangle Chance for All’s latest rescue, is about six months old. As a “teacup” pig, she started out very tiny…but she has gotten big! When full grown, she could weigh 200 pounds or more. Now we need your help to give her the vet care she desperately needs. We are running a week-long crowdfunding campaign to raise funds for Lola’s vet expenses. The funds raised for her care will cover the costs of spaying her, getting her vaccinated, and getting her a microchip. These are crucial procedures. Besides preventing her being used for breeding, a spay procedure will help her avoid some of the main health problems that kill pigs like Lola, such as reproductive cancers. Pigs over a certain age and weight have higher risks of complications when being spayed, so NOW IS THE TIME to give Lola the gift of well-being through a spay. Microchips are very important to insure the safety of animals–including animals like pigs, who are notorious escape artists. By getting Lola microchipped, we can make it easier to find her and get her back to safety should she ever escape. We want to give Lola health and safety with a spay, a microchip, vaccinations, and other care. Please help us give Lola the long, happy life she deserves by donating to our campaign by April 7th.